In 1870, a father and son, Henry and Charles Lum, purchased the land for 25 cents an acre. The first structure to be built on this uninhabited oceanfront was the Biscayne House of Refuge, constructed in 1876 by the United States Life-Saving Service at approximately 72nd Street. Its purpose was to provide food, water, and a return to civilization for people who were shipwrecked. The next step in the development of the future Miami Beach was the planting of a coconut plantation along the shore in the 1880s by New Jersey entrepreneurs Ezra Osborn and Elnathan Field, but this was a failed venture. One of the investors in the project was agriculturist John S. Collins, who achieved success by buying out other partners and planting different crops, notably avocados, on the land that would later become Miami Beach. Meanwhile, across Biscayne Bay, the City of Miami was established in 1896 with the arrival of the railroad, and developed further as a port when the shipping channel of Government Cut was created in 1905, cutting off Fisher Island from the south end of the Miami Beach peninsula. Collins’ family members saw the potential in developing the beach as a resort. This effort got underway in the early years of the 20th century by the Collins/Pancoast family, the Lummus brothers (bankers from Miami), and Indianapolis entrepreneur Carl G. Fisher. Until then, the beach here was only the destination for day-trips by ferry from Miami, across the bay. There were bath houses and food stands, but no hotel until Brown’s Hotel was built in 1915 (still standing, at 112 Ocean Drive). Much of the interior land mass at that time was a tangled jungle of mangroves. Clearing it, deepening the channels and water bodies, and eliminating native growth almost everywhere in favor of land fill for development was a herculean effort. The Town of Miami Beach was chartered on March 26, 1915; it grew to become a City in 1917. Carl Fisher was the main promoter of Miami Beach’s development in the 1920s as the site for wealthy industrialists from the north and Midwest to build their winter homes here. In addition, Fisher built five hotels (none surviving). In the 1920s, Fisher and others created much of Miami Beach as landfill by dredging Biscayne Bay; this man-made territory includes Star, Palm, and Hibiscus Islands, the Sunset Islands, much of Normandy Isle, and all of the Venetian Islands except Belle Isle. The Miami Beach peninsula became an island in April 1925 when Haulover Cut was opened, connecting the ocean to the bay, north of present-day Bal Harbour. The great 1926 Miami hurricane put an end to this prosperous era of the Florida Boom, but in the 1930s Miami Beach still attracted tourists, and investors constructed the mostly small-scale, stucco hotels and rooming houses, for seasonal rental, that comprise much of the present “Art Deco” historic district. 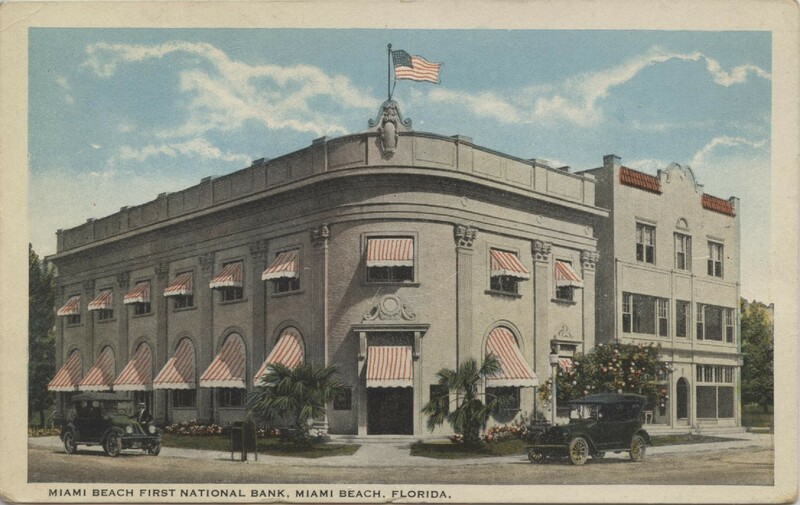 On November 17, 1921 the Miami Beach First National Bank was issued a charter. Notes were signed by John J. Hutchison, cashier and F.L. Wall as president. 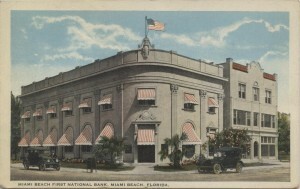 The bank became the Flagship FNB of Miami in the 1970’s, and was located on ALton Road at the corner of Washington Avenue. On November 6, 1933 a charter number of 13828 was issued to the Mercantile National Bank of Miami Beach and after only 3 years of printing, the bank stopped printing money in 1935. The Mercantile National Bank Of Miami Beach issued 2 different denominations of national currency, the $5 and $10 type 2 notes. Notes were signed by Leo Robinson, cashier and Charles Leiberman as president.